If you never spent a night in a treehouse before, you may have a lot of questions but you also have all possibilities. To help you see the forest for the trees again, we will introduce the different kinds of treehouses in the following sections, and will inform you about the may possibilities of a treehouse holiday. It doesn’t matter whether you are searching for a treehouse for the whole family or with your partner – we will give you an overview and all information that you need to make a decision. First of all you should know who you want to spend the holiday in the treehouse hotel with. Do you travel with your partner and seek a romantic treehouse? Or do you search for adventures and action? Depending on the duration of your stay you can choose the location or country. If you are only up to a short trip, you can look for treehouses in Europe. Depending on the season, Italy or in winter Sweden are wonderful travel destinations. If you don’t have so much time to plan your holiday, you can choose from offers in Germany. But be careful! Treehouse hotels are very popular, so you should book early enough to get your favorite room. 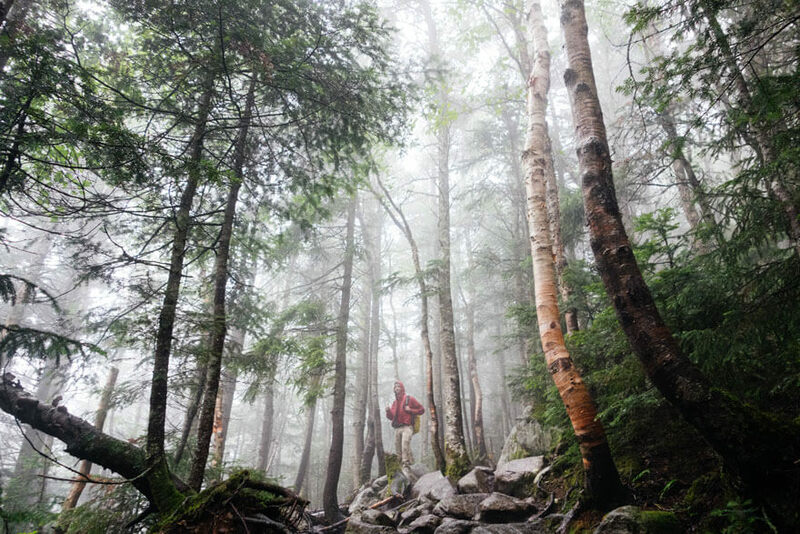 The variety seems limitless, because depending on where you are searching you will find specific treehouses. If we narrow the search down to Europe, there are many classical wooden houses. Those who prefer a natural atmosphere will find good spots in Germany, Austria and Switzerland. 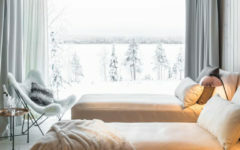 Also our Nordic neighboring countries offer treehouse hotels close to nature, in a beautiful environment. This can be super-exciting for some and totally boring for others. Therefore you can also have a look to other continents. Especially warm countries like Africa or South America offer great and breathtaking treehouse hotels. Their architecture is totally different, because in each country they use local materials. So you can dream for example at 30 degrees under a bamboo roof and listen to the ocean’s waves. Now you have to make a first selection. If you look at the time and available budget for your holiday, the choices can be narrowed down quickly. After you made this first step, you can often still choose between different variants. From spare to luxurious equipment there are lots of opportunities – what ever you like. Those who want to let their childhood dream come true will be excited about a simple treehouse room with a pretty red-and-white checkered bedding. Those who want to relax completely and be indulged in a natural environment can choose a treehouse hotel with great comfort and luxurious equipment. When it comes to the choice of treehouse hotels, there is nothing left to be desired. For the extravagant and design-lovers we recommend some special treehouse hotels. They impress with straight design and big windows that are ideal to enjoy the view. But there’s more to come: Their equipment also offers great comfort. You can find everything from a big bath tub to a whirlpool at luxurious treehouse hotels. Especially in exotic regions, like Bali or Costa Rica, treehouse hotels are equipped with all imaginable comfort. These regions offer a stay that you will never forget. The building materials of the treehouses are often local woods. You will sleep with the greatest comfort under an exotic bamboo roof. Because of the warm weather most of the treehouses have no window panes. The open architecture and variety of beaches, whirlpools or spas will convince even those guests who aren’t hooked at the first sight of these beautiful holiday destinations. Another advantage of treehouse rooms abroad: The breakfast lodge is most of the time very close to the apartments, so you can walk to your dinner, breakfast or for a drink to the bar. Those who prefer a short journey may have a look at the luxurious treehouse hotel in Berlin. It may sound surprising, but at this comfortable treehouse you can enjoy real tranquility. 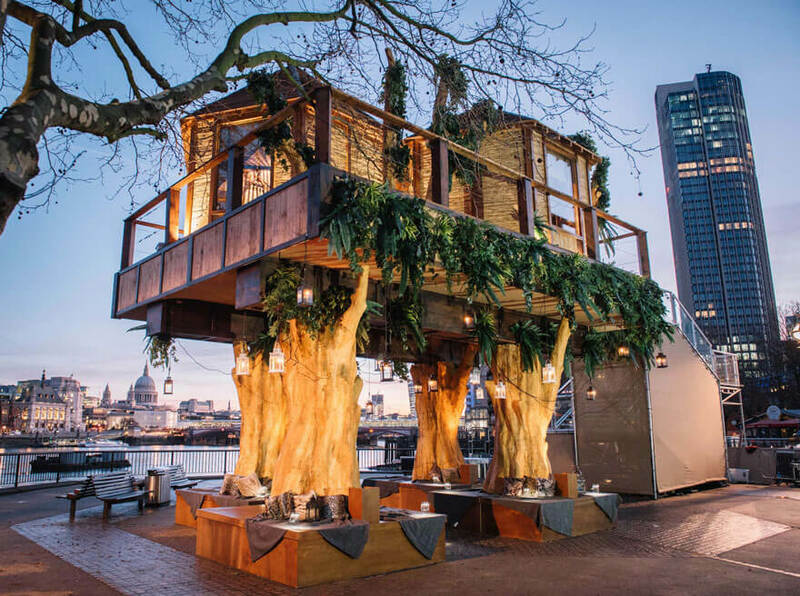 The treehouse hotel «The Urban TreeHouse» offers everything the heart desires. The extravagant furnishing includes a shower outside and a private sauna area, surrounded by a wooden fence. The elegant and minimalist architecture is ideal for travelers who seek a luxurious high-end holiday. Big windows and light-flooded rooms let the inspiration flow and encourage some people to deep thoughts. An ideal location for everybody who needs a short break from the big city life. If you don’t mind a few hours drive to your destination, you can experience a real piece of art design in Sweden. At Treehouse.se you can sleep in an art piece. 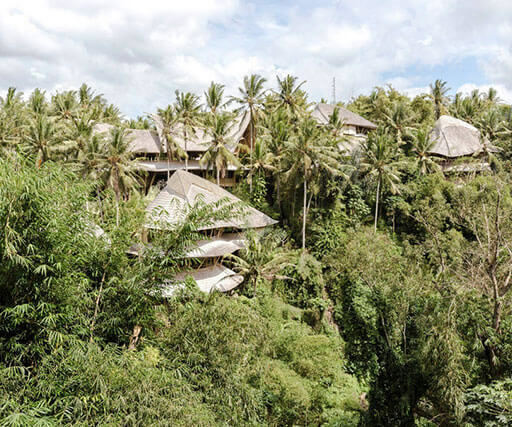 Each of the luxurious treehouse hotels is individual and definitely an eye-catcher. Rooms like «The Ufo» or «The Bird-Nest» really live up to their names. If you stay at the treehouse room «Bird-Nest», you will sleep in a treehouse that is perfectly integrated into nature. From outside it looks like a giant bird-nest, inside it is a little paradise. In the comfortable double bed two people can spend a wonderful night, and in winter they can huddle together at the fireplace. Round little windows round up the atmosphere. Especially in winter the bird-nest is a wonderful accommodation because the branches of the trees are covered in snow. 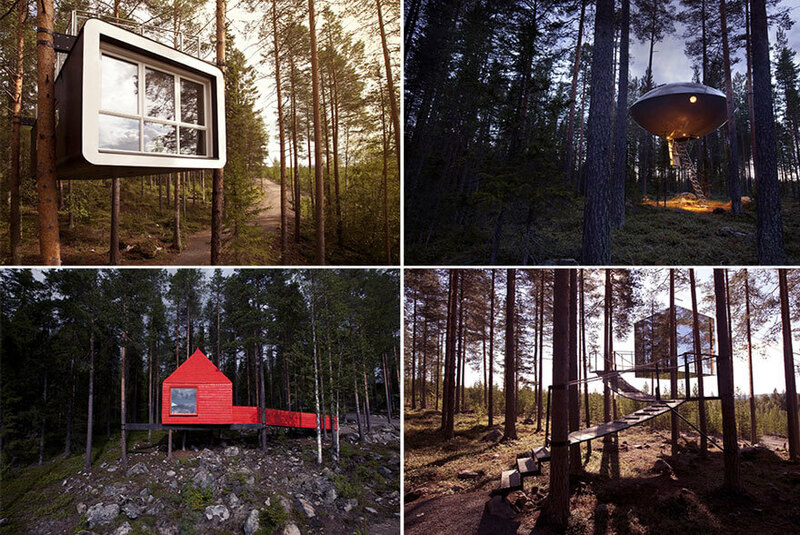 If you always fancied traveling to space, the «Ufo» treehouse hotel will bring you a little closer to that dream. The luxurious treehouse hotel is built high up in the treetops and can be accessed with a foldout ladder. As soon as all passengers are aboard, the ladder can be lifted up and the dream of flying to space can begin. The only catch: The Ufo treehouse doesn’t have a lot to do with a classical treehouse. Now we heard enough about crazy and extravagant treehouse apartments – now we become adventurers. For all those who like to have some action in their holidays, we will now introduce the most breathtaking treehouses. If the forest is a mythical place full of wizards and trolls for you, the «Kulturinsel» (Culture Island) is the right place for you. In Görlitz they have probably the weirdest treehouse hotels. Crooked windows and sloped roofs will make your imagination go wild even when you only look at the pictures. If you always wanted to sleep in a bewitched forest at 10 meters height, you should choose the «Kulturinsel». Not only the inventively designed treehouses with names like «Olfes Tree Castle» or «Judkas Troll Family House» make visitors become real adventurers – it’s also the many events that offer a good program for the whole family. To make your holiday perfect, the Wilderness Park can be visited in close vicinity. After so much adventure and action you will get the true holiday feeling at the breakfast buffet – which spares you the adventure of washing up. 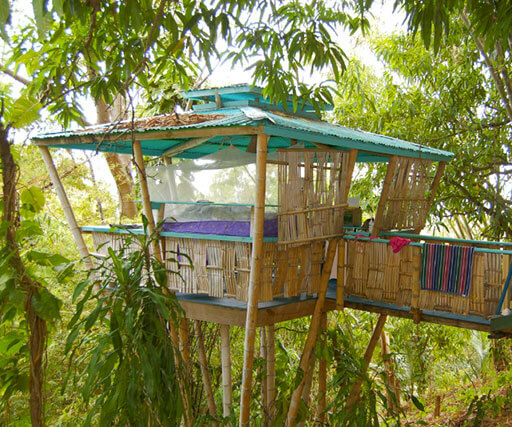 Those who think this is too much adventure can search on for other treehouse hotels. Many of the available accommodations are located close to nature parks amusement parks. You can choose between different activities, depending on the season and place. At the Resort «Baumgeflüster» (Whispering Trees) at Bad Zwischenahn you can spend comfortable nights, and many leisure activities invite you to some adventures. The treehouse hotels are equipped comfortably and even offer a small balcony. Depending on the season you can go water-skiing, winter-hiking or climbing. But there’s more to come: The surroundings of the treehouse hotel offer suitable activities for every small and big adventurer. A real plus is that the treehouse hotel is not only oriented towards the little guests. Adults will also enjoy staying in the elegant and well-equipped treehouse rooms after a day full of adventure – and during the day they may visit a museum or the gardens. For families, treehouse hotels are among the best ideas for a good holiday. A room high above the ground, high up in the treetops, will raise joy in everyone, no matter what age. 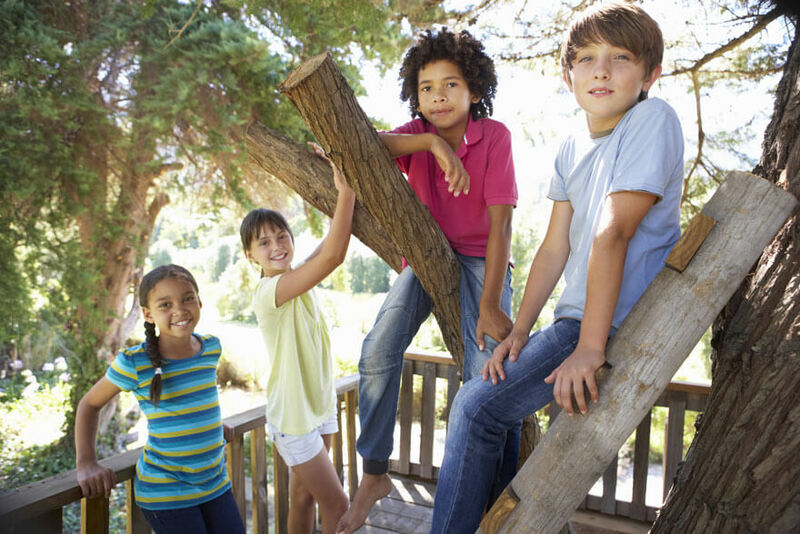 The good thing about treehouses is the fact that the kids may play outside, beneath the treehouse. If the parents want to have some rest, they can search for a treehouse hotel with a great variety of leisure activities. They offer children a day full of adventure and adults a little tranquility. The activities range from climbing, canoeing or horse-riding to real adventure-tours. Many treehouses in Germany offer a large program and at the same time a good atmosphere for adults. If you are still searching for the full adventure program you can book a treehouse hotel at Center Parcs or the adventure park «Kulturinsel Einsiedel». There you’ll get pure action during the days and also the evening programs. At the «Kulturinsel» there are funny troll dinners with a theater show, while at Center Parcs children can spend their days with horse-riding or climbing. What should be considered when choosing a treehouse hotel for the whole family? When choosing a treehouse hotel for the whole family you should have a look at the arrangement of the rooms. While some treehouses offer enough space for five people in one room, others allow children to sleep in a separate treehouse. This is the ideal solution for parents who want to have a few undisturbed minutes for themselves. 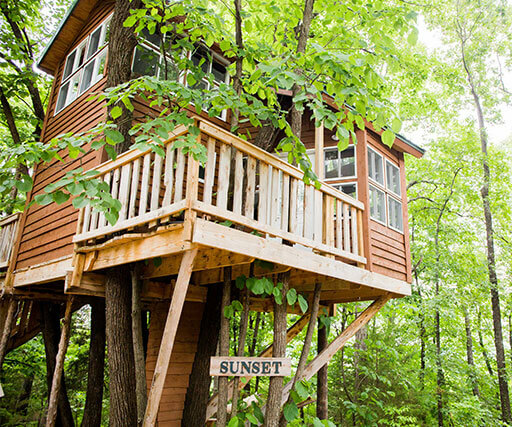 We don’t recommend a stay in a treehouse with small children who just learned to walk. Most of the treehouse hotels are built in a height of 8 to 10 meters. Dogs and other pets are also rarely allowed at treehouses. 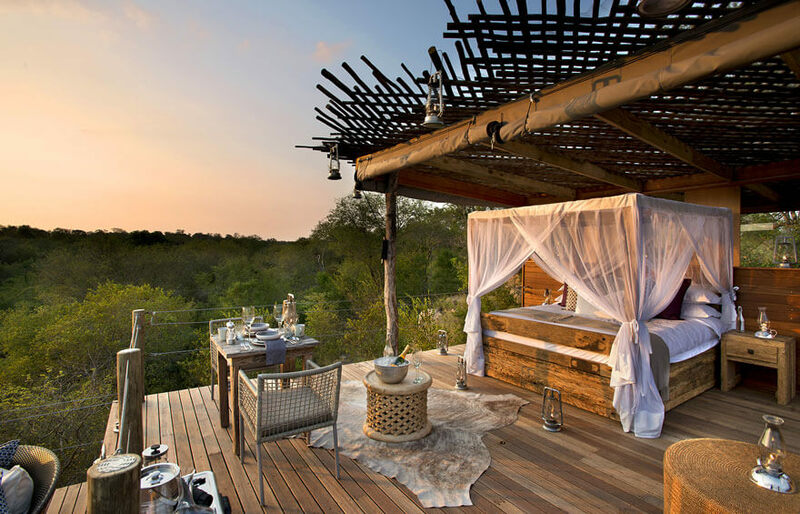 If luxury and adventures are not important for your choice of a treehouse hotel, you are especially lucky – because most likely you will spend your holiday with your darling. 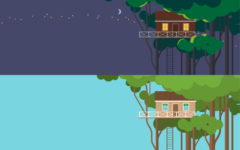 The big advantage: It will probably be wonderful no matter where the treehouse is located. But we won’t make our work that easy. So here come the most beautiful and romantic treehouses for a holiday for couples. You always wanted to sleep in a fairy tale castle? Here’s your chance! The «Chateaux dans les Arbres» (Caste in the Trees) in France is a treehouse with the shape of a little castle. The cute wooden house has a lot of little round towers that are illuminated at night to create a romantic atmosphere. A great spa program and the tranquility of nature turn a stay here into an unforgettable experience. If you book the suite you will even have your own outside bath tub on the terrace of the treehouse. The best conditions for an unforgettable holiday. Another beautiful treehouse hotel in Austria is the treehouse of the Prechtlhof. If offers unparalleled romance, starting with the furnishing of the rooms. It’s not very modern but has a wonderful romantic touch. The classical treehouse invites you to dream and maybe spend a whole day in the comfortable bed. 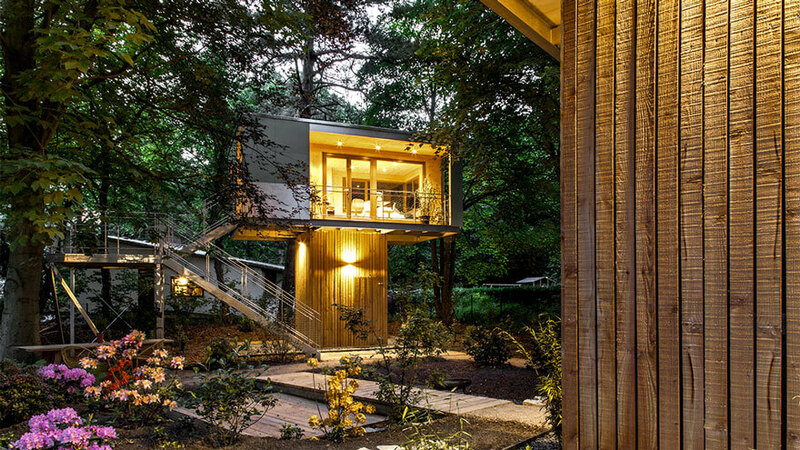 The luxurious treehouse room has a balcony and even a roof terrace. Small and elegant, this house was built around the stem of a 300-year-old oak. 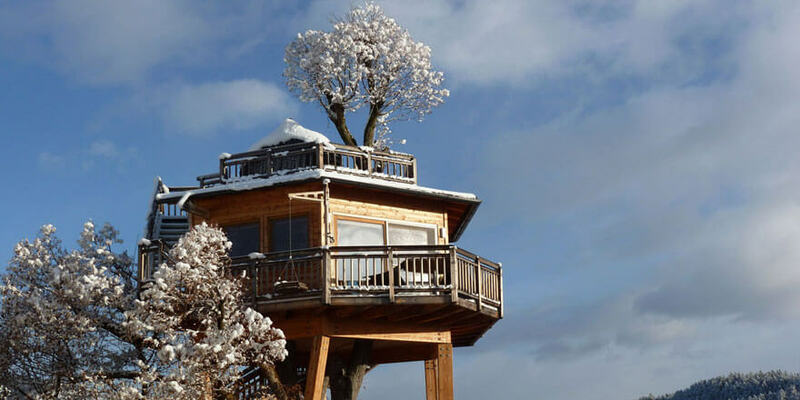 An ideal treehouse hotel for summer and winter holidays. But this is still not everything the treehouse world has to offer. Wonderful and idyllic treehouse apartments are also to be found at the lakes of Switzerland, with breathtaking views of the Alps. If Switzerland is too expensive for you, you can search for cozy treehouses in Austria and Germany. And if you don’t like the weather there, you’ll maybe make a find in Italy. 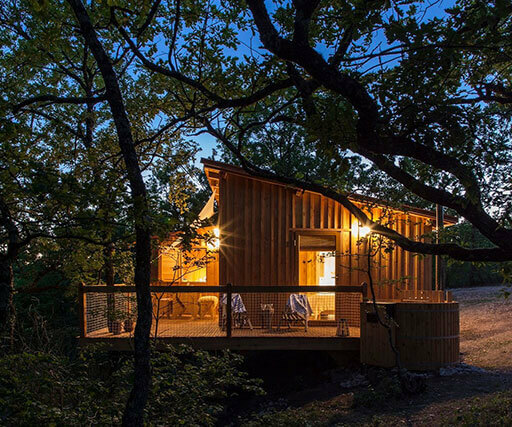 Romantic treehouse hotels at Tuscany invite you to relax and stay. They impress with wonderful leisure activities, like wine-tasting or extended walks through fields of lavender. 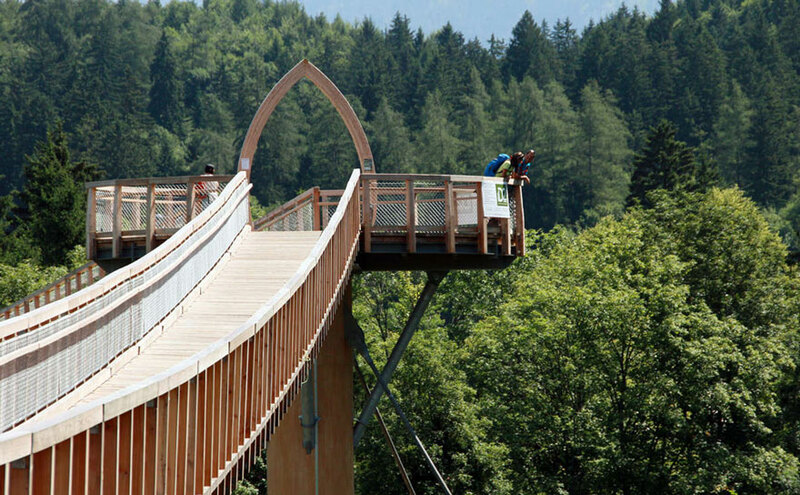 Those who search for a full package of romance will like the Baumkronenweg in Austria. Here you can book a full package. Between high firs the treehouse apartments are built in about 5 to 8 meters height. The package includes a candlelight dinner with a menu of several courses. Additionally, you can book a horror-themed walk at night. If you fancy more relaxation you can fit in a wellness day and enjoy a massage. The ideal option for a wonderful weekend for couples. Another wonderful treehouse hotel is the treehouse Seemühle. The hotel is located close to Frankfurt at Gräfendorf and has many advantages. In addition to nice rooms with a classical wooden look, the hotel also offers great facilities. 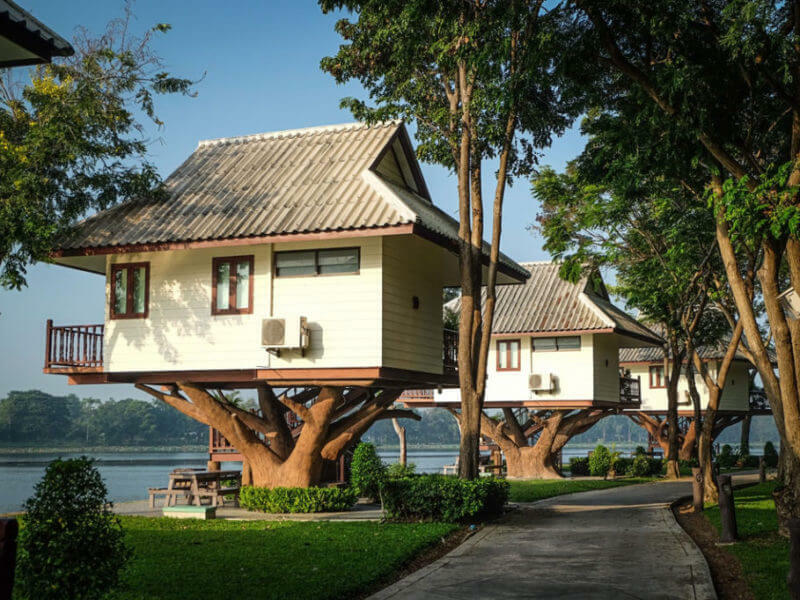 Depending on your wishes you can choose between different kinds of treehouses. You can book the luxurious room «The Cottage», which is suitable for 2 to 4 persons. It has a bathroom with a shower and is furnished with beautiful old wooden furniture. 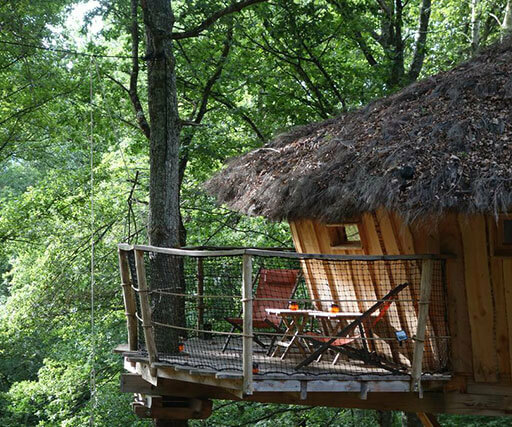 If you’d rather like a local room in the treetops, you can rent the «Studio TreeHouse». The room was designed by the artist Rike Dörin and impresses with a great furnishing. The furniture and bathroom are adorned with lovely decoration elements. The big balcony that sticks out right into the treetops is an invitation to relax. It can also be used for a romantic breakfast. But it doesn’t matter which apartment you choose, each of them offers a great comfort. And that’s not the end of it, because the treehouse resort Seemühle also offers a lake that is perfect to undergo a Kneipp cure or have a bath. In winter you can spend the cold days in the Mühlensee Sauna. So this is the ideal spot for couples who want to relax and have an unforgettable romantic weekend. Those who like to have a little action in addition to cuddling, can go skiing in winter. After a cold day in the snow the hot sauna gets a totally new value. In summer you can go for a canoe drive on the lake Mühlensee. What could be more romantic than being together alone on a tranquil lake? If you would like to know more about the treehouse hotel Seemühle you can read our full article about it. The Treehouse Hotel Seemühle offers several packages. If you book early enough, you’ll get a great discount and several additional offers. These were our chosen treehouses for you. 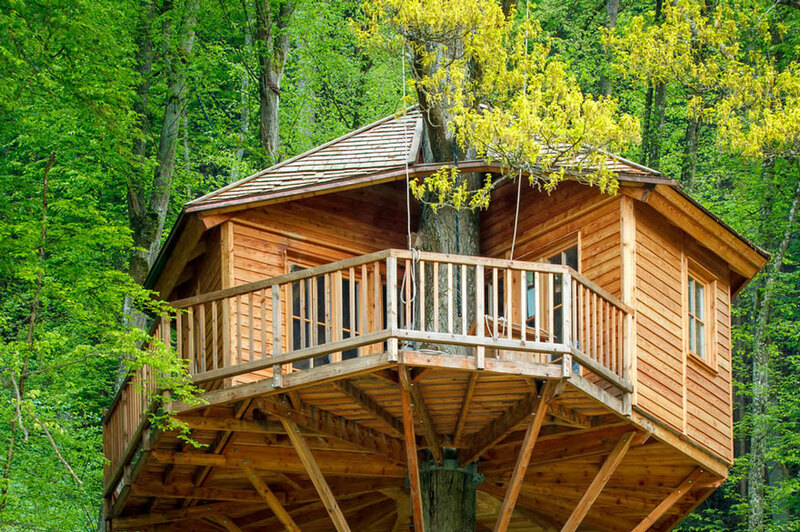 If you still couldn’t decide, you can continue your search on the internet – and you will definitely find more great treehouses. We introduced our favorite treehouses to you and hope you could discover your own love for some of them. If you have an insider tip you want to share with us, we will add it to our list.